Good luck not licking your bowl clean with this one! This soup is fabulous and super easy to get going in the morning...and finish off just before dinner. Please make note of when the tortellini and cream cheese are added. Enjoy! Place the sliced mushrooms, chopped spinach, melted butter, soy sauce, vegetable broth, and Italian seasoning into the base of the slow cooker, and give it a gentle stir. About an hour before dinner, pull out the cream cheese and cut into cubes. Then leave out to soften. Set on low and cook for 8 hours. With 15 minutes left in the cooking cycle, stir in the softened cream cheese cubes and the tortellini. Let cook on low for 15 minutes, or until the tortellini has softened. Ladle into serving bowls immediately, so the pasta doesn’t overcook. 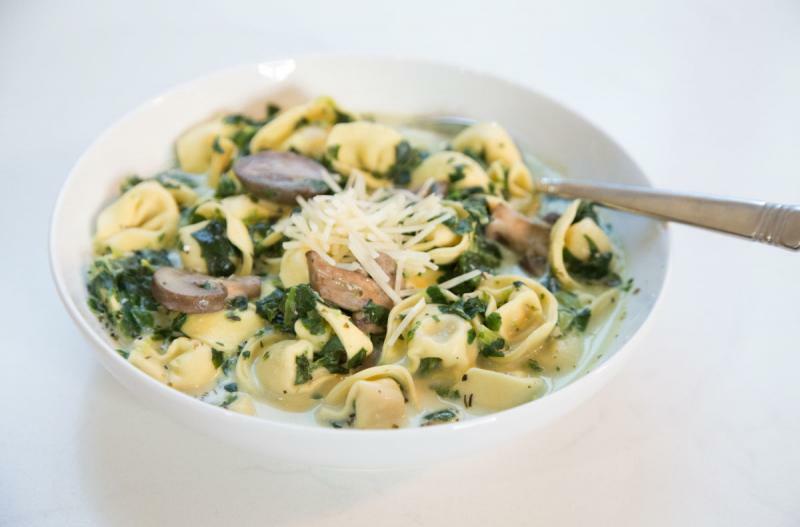 Serve Slow Cooker Spinach-Mushroom Tortellini with grated Parmesan cheese garnish, and side salad. Note: the tortellini can be frozen in it’s packaging. Do not mix it in with the other ingredients before freezing. Put baggie in the freezer and freeze up to 6 months in fridge freezer or 12 months in a deep freezer. Thaw in the fridge overnight, or a warm bowl of water for about 20 minutes, before transferring to the slow cooker and cooking on low for 8 hours. With 15 minutes left in the cooking cycle, stir in the softened cream cheese cubes and the tortellini. Thaw and slow cook on low for 8 hours. With 15 minutes left in the cooking cycle, stir in the softened cream cheese cubes and the tortellini.